After I have been working in KL for 1.5 years, my weight has gone up 72kg and have a big belly. Therefore I've decide to cut down my weight and get a six packs. After 84 days, my weight has gone down from 72kg to 62.3 kg. 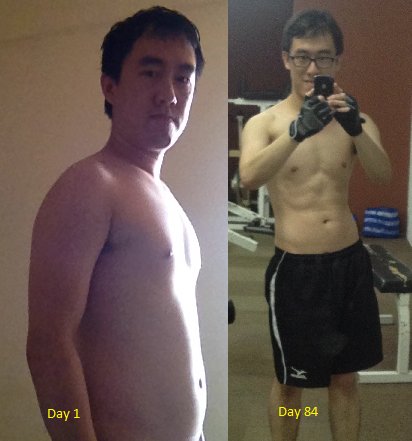 Also, the six packs is visible down (the lower 2 abs is not so obvious though). Discipline, discipline and discipline. I have to control my calories strictly and to attend gym regularly. Even if not feel like to go gym, will have to do chin up or leg raise at home.As long as we continue to do small achievement every single day, we can have big achievement one day. Sunday can have a bit more calories such as 1/5 watermelon, 0.5kg papaya etc.